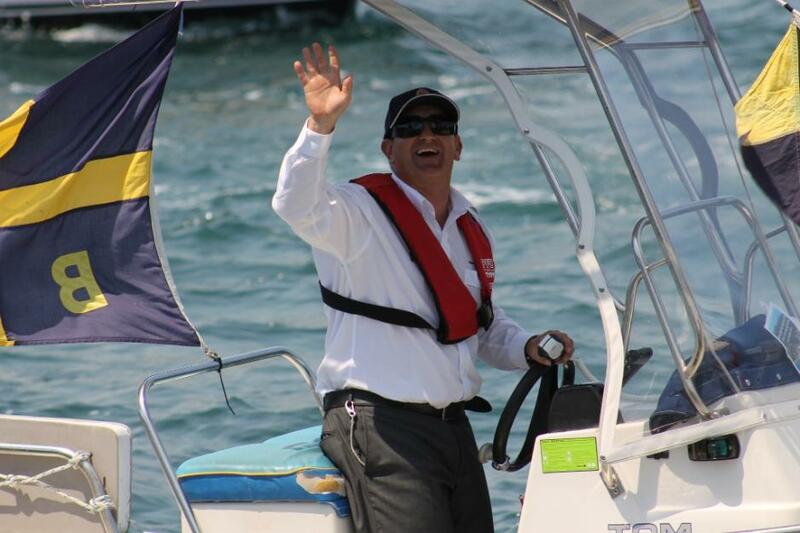 A farewell was held for Peter Moxham, Marina Manager at Royal Motor Yacht Club this week. When we spoke to Peter he was overwhelmed with the messages of support and even telephone calls from people overseas wishing him the very best for his future and thanking him for years of attending to their vessels and the Marina. Starting in May 1995, becoming Dockmaster in October 2005 and Marina Manger in April 2006, anytime you speak with Peter he wants to talk about the work… “I don’t like a fuss”… not how well he does the work. Mr Moxham spoke of the Multi-agency Firefighting Drill we attended in 2012 as a reassuring step forward in Marina practices, advancements in newly installed equipment ensuring the RMYC Marina maintains the pristine waters of Pittwater, and nominated another highlight in the Royal Motor Yacht Club Broken Bay winning the 2011-2012 Club Marina of the Year - Marina Industries Association. It’s not just what you do though, it’s how you do it. Peter’s nature has made him friends among all those he has looked after for so long. At a farewell BBQ attended by over 100 people on Thursday, past-Commodore of Avalon Sailing Club, Richard Rasdall, was among many who visited to wish Peter all the best in the future. An indication of the respect and regard in which Peter is held within our whole community. A Barrenjoey High School student, Peter began what has been 28 years in the Marine Industry as a Shipwright with the Maritime Services Board NSW at Goat Island. He moved closer to home as Dockmaster at d’Albora Marina Akuna Bay then did a stint as a Shipwright at Modern Concept Yachts before commencing at the prestigious RMYC- Broken Bay. He has been at the Newport club for over 18 years. Having grown up on the water and still spending time off at places like Refuge Bay or indulging his passion for fish and chips by a run to a very popular place at Patonga, the move to such a great club that is on the water and serves some of the best fish and chips we’ve ever tasted may have been an instant “Yes!” for Mr Moxham. The RMYC Broken Bay is well known for investing in and encouraging staff to a lifelong learning path. Peter Moxham is also well known for not only encouraging others to learn new skills but also pursuing this himself. 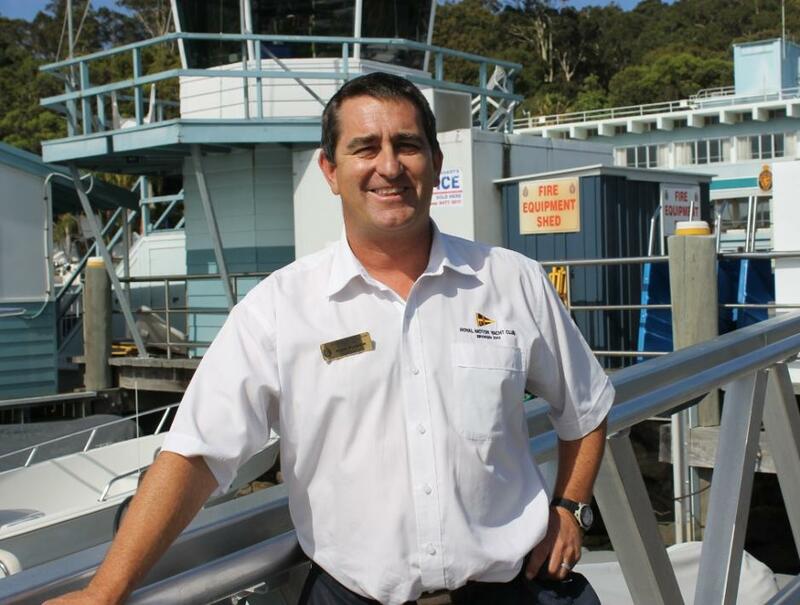 Mr Moxham achieved CMM (Certified Marina Manager ) in 2011, became a Member of the Marine Industries Australia Education Committee in Sept 2011 and has trained many people since. General Manager Karen Baldwin presented Peter with a Membership for the Royal Motor Yacht Club Broken Bay on Thursday. 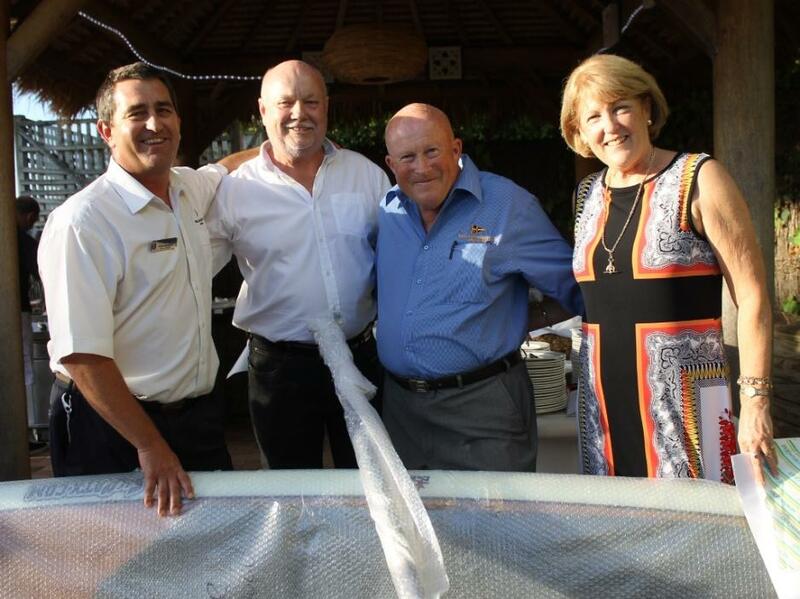 Commodore Peter Haig and Vice-Commodore Chris Lee of the Royal Motor Yacht Club – Broken Bay presented Peter with a Stand Up Paddle Board on behalf of Members and the Directors. When Pacific Pontoon and Pier head hunted you they knew what they were doing. It is not easy to find gems like you. I am sure that you will spread success wherever you go. The people who you work with in your next job have no idea what they are up against especially Graham Chatfield, time to reverse the roles. You are a very highly skilled professional. With your levels of performance, dedication and professionalism, you have set the bar high for our new Marina & Facilities Manager, Jayson McDonald. As past Rear Commodore it has been a pleasure to work with you. The Marine meetings have been long only because of your passion and exuberance for this great club; we couldn't shut you up especially when I asked for a short meeting, we got a longer one. Thank you for putting in the years of hard work. I wish you nothing but the best in your future career, employees like you are hard to come by. The club was lucky to benefit from your talent for all these 18 ½ years. You gave 100% and much more. We value your contribution, determination, grit, dedication, commitment and hard work, they are like your second nature. We are sure you will take these qualities with you wherever you go. Your skills are unbeatable and your attitude at work is unmatched. We couldn't have asked for more. Over the years we have received numerous emails and letters about the above and beyond level of service you, Doug and the Marine attendants have given to members and visitors to our club. We are sad to see you go but we are happy to have had the chance to work with a dynamic individual like yourself. We wish you good luck and success at your next role with Pacific Pontoon and Pier. Your customer service levels were exemplary and we truly respect that you went the extra mile to uphold the clubs image. Best of luck mate. Peter told us he will still be around Newport, probably "needing a full transfusion to get RMYC out of his system. " We suspect he will also be doing a bit of paddling…among other watery pursuits. The new Marina Manager is Jayson McDonald. 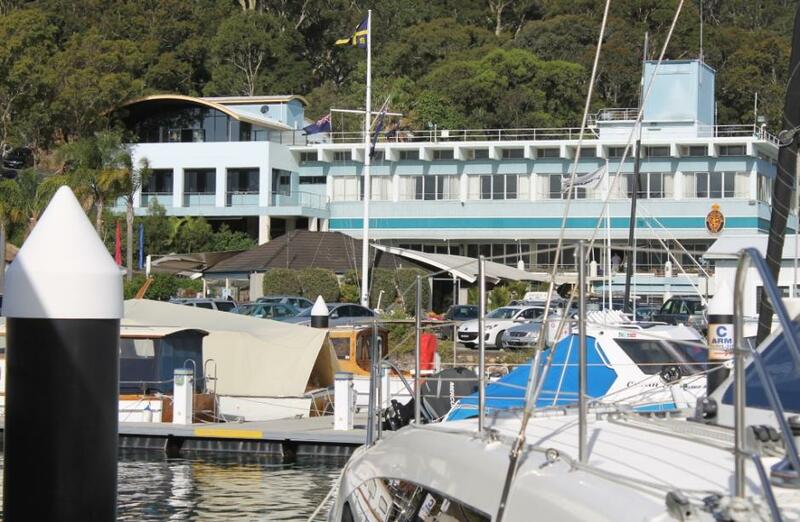 The Royal Motor Yacht Club Broken Bay, offers a world-class marina facility with permanent and casual berths. The club provides secured parking for boat owner members and access to a range of services from ''boat pack'' on board catering to a slipway facility for vessels up to 60 tonnes. There are also club moorings at America Bay, Refuge Bay, Coasters Retreat and Patonga (Brisk Bay). Peter Moxham, Vice-Commodore Chris Lee, Commodore Peter Haig and Karen Baldwin. 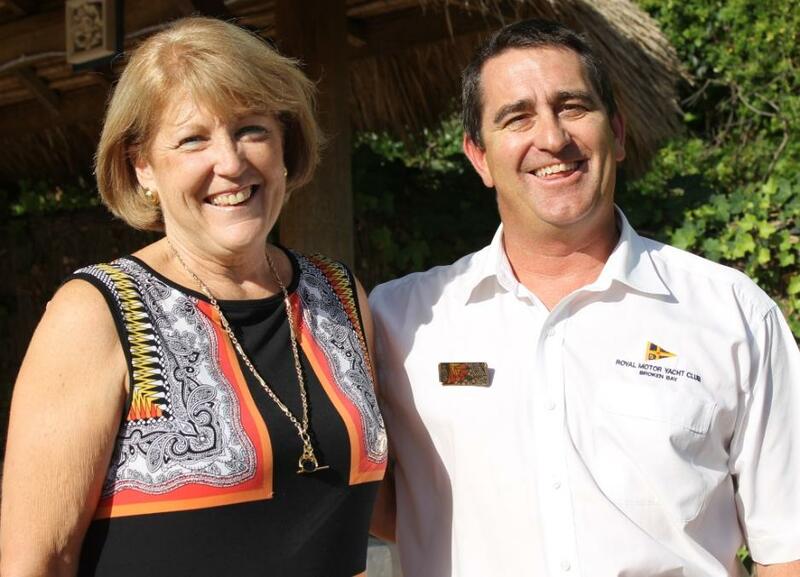 Karen Baldwin General Manager of RMYC -Broken Bay and Peter Moxham, Marina Manager. Words and Pictures by A J Guesdon, 2012-2013.